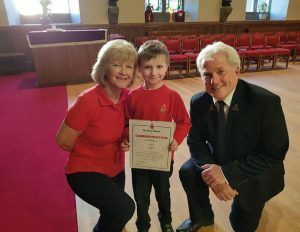 Nathan was presented with his President’s Commendation at the 2nd Gorouck’s Annual Parent’s Evening by Company Captain & Battalion President of Inverclyde & District Battalion, Alan Aitken MBE and his wife, Helen Aitken, Officer in Charge 2nd Gourock Anchor Section. Nathan recently successfully completed three years of treatment for leukaemia. He also fronted the Glow Gold children’s cancer awareness campaign in Inverclyde. It is only the second time such a commendation has been awarded to a 2nd Gourock Company member in their 120-year history. His positive, cheerful attitude and enthusiasm is an inspiration to all that know him and the Brigade is proud to have him as a member. Corporal Nathan Davis of the 1st Bluestone Methodist BB Company was presented with the President’s Commendation for his dedicated commitment to BB, church and community despite ongoing health issues. Nathan has also gained his Queen’s Badge and Silver DofE Award and is on the Fields of Life overseas outreach team, that is going to Uganda in July. The award was presented on behalf of the Brigade President by Honorary Brigade Vice President, Mr Perry Donaldson J.P.